There is a lot of concern about how baseball will change in this era where people's attention spans are shorter than ever and games that can routinely go on for as long as four hours seemingly feel longer than ever. How baseball will "reinvent" itself to move from the slow pace of a bygone time that characterized the games of the 20th century is the overriding debate around the game. 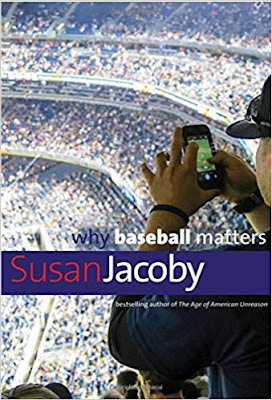 Susan Jacoby, in her new book Why Baseball Matters, explores how baseball has reinvented itself all along in ways people didn't realize because they were so natural. The biggest ways baseball has "reinvented" itself was the breaking of the color barrier by Jackie Robinson of the Brooklyn Dodgers in 1947, the adding of the the designated hitter in the American League in 1973, the ending of the reserve clause which allowed players to become free agents in 1975, and the preponderance of artifical turf in the 1970s and '80s, which she called "surely one of the greatest atrocities produced by late-twentieth century technology's application to sports." Jacoby wrote of the reserve clause, "When I was a child, back in the 'good old days,' Major League Baseball operated with a so-called reserve clause in the uniform contract that prevented a player from negotiating for what his services were worth on the open market and bound him to one team for his playing life - unless his owner agreed to trade him (or, as happened, traded him against his will). Baseball as it was then, however famous and beloved some of its stars became, resembled nothing so much as indentured servitude." Many people were against letting players become free agents, but Jacoby was all for it, as she writes, "I am not among the curmudgeons. Why shouldn't players with extraordinary skills - skills that, as baseball statistics tell us clearly, decline for nearly everyone after the early thirties - make what they are worth to their teams in the days of their youth?" Jacoby got into baseball as a child watching the White Sox and Cubs in her grandfather's bar in Chicago, and the great memories she has of falling in love with the game. On what those days were like, she writes, "There was nothing I wanted to do more than listen, on and on, to the arguments - about baseball and everything else - conducted in Chicago's distinct second- and third-generation Irish American accents. I now realize that this regular time out of time, spent listening to and talking with adults while watching the game we all loved for as long as the game lasted, was as different from today's technology-obsessed childhood as my childhood was from the one described by Laura Ingalls Wilder in her Little House on the Prairie series, set in the 1870s and 1880s. "I suspect that my own nostalgia, to the extent that it colors my thinking about baseball, has as much to do with the grandfather I loved, and with his bar, as with the game itself. But there is certainly nothing warm and fuzzy about the memory of racial epithets spouted in a major league ballpark six years after Jackie Robinson became the first black American to play in the twentieth-century major leagues. indeed, this experience belonged to the decidedly unsentimental side of my education, in a school more realistic and rigorous than the one I attended on weekdays." Jacoby writes that baseball has demonstrated the ability to reinvent itself during periods of immense social change. They will need to do that here to attract a new generation of fans that can't sit through a four-hour game. "To regain the attention of young fans," she writes, "baseball will have to reinvent itself again - as it did after the First World War, when the lively-ball era came into its own with the arrival of Babe Ruth; as it did when the old system of a team 'owning' players was replaced by free agency in the late 1970s; as it did when baseball finally owned up to its own drug problem, which vitiated so many records of the 1990s. "Can baseball get the minds of the young back in the game, even though the culture of my grandfather's bar is gone? I hope so, because next to reading and making love, no other pastime has given me more pleasure and knowledge throughout my life. But I never make predictions, especially about the future." Baseball is definitely the fabric of America, as it has connected generations in a way nothing else can. Yankees fans can sit with their grandparents and compare Mickey Mantle to Derek Jeter for hours and whether this team can hit as well as the 1927 team. Not many other sports can produce these kinds of detailed debates rich in detail. Jacoby does a great job of including people's thoughts on baseball through the years, such as from cultural historian Jacques Barzun, "whose 1954 observation 'whoever wants to know the heart and mind of America had better learn baseball' is probably the most widely quoted encomium to a sport ever written by an intellectual." The thing about baseball, as Jacoby points out, is that while baseball can reflect life, sometimes it can be separate and provide people a respite from what is going on, which is true going back a hundred years. One of those times was during the 2016 presidential election. "Baseball, the business, is and always has been affected and afflicted by all the social realities of American life - from racial segregation through drug use," she writes. "But if the business of baseball is just like life, the game of baseball, as it is played on the field, is anything but a reflection or representation of ordinary experience. Those of us who love the game between the lines should acknowledge that we love it precisely because it is not like life. Baseball, played as it should be, is fair and governed by rules. Never was the difference between baseball and life demonstrated more vividly, in a fashion that could be backed up by statistics as well as emotion, than during the thrilling 2016 World Series between the Chicago Cubs and the Cleveland Indians - a seven-game drama with a final act that ended during the closing weeks of the most disturbing and mendacious presidential campaign in modern American history. Was the presidential election 'rigged,' as then-candidate Donald J. Trump claimed? (Presumably it was not, since Trump won in the electoral college - while losing the popular vote - even though he had insisted that the proceedings were rigged against him.) But the millions of Americans, Trump and Hillary supporters alike, who forsook the endless campaign coverage for the World Series could be certain of one thing: the spectacle they were watching on the field wasn't rigged - right through the dramatic ten-inning comeback win by the Cubs in the seventh game. According to Nielsen Sports, more than forty million Americans tuned in to the decisive contest, making it the most-watched baseball game in nearly twenty-five years. It may not be surprising that in Chicago and Cleveland, 70 and 69 percent of households with television sets on were tuned into the game. (This figure is known as a 'share' in the ratings industry.) What is more surprising is that throughout the country, in places with no rooting interest in either team, the share was 40 percent. Viewership for the seventh game of the 2017 World Series, in which the Houston Astros defeated the Los Angeles Dodgers, was down 28 percent from the 2016 seventh game. The lower ratings were not due to lack of excitement in the overall seven-game series, but to a more pedestrian final game, in which the Astros took command with five runs in the first two innings. "In both 2016 and 2017 - years marked by political upheavals and natural disasters - a lifelong baseball fan could be reasonably certain of one thing: the men on the field were playing by the rules, and most of the rules would have been just as recognizable to my grandfather as they are to me. Yet for any modern fan who looks at baseball honestly, nostalgia cannot be the driving force in love of the game." Those last couple of sentences are ones that should be remembered when talking about changes to the game right now, such as the use of replay, the 30-second clock for a pitcher to throw that is now seen in stadiums or limiting mound visits. The game itself is the same it always has been, and fans for generations would say those actually are necessary moves that could have been done years ago. Don't let minor changes affect your love for what is the great game of baseball. What compelled you to write this book? How does baseball figure in your life? Baseball has been an important part of my life since early childhood, when I learned to understand this complicated game while watching the Chicago White Sox with my grandfather and his friends on the color television set - the first in the neighborhood - in my grandfather's bar. Apart from reading, baseball is the only pastime that has given me immense pleasure throughout my life. Does baseball matter? How will baseball have to change in order to keep mattering? In recent years, I became disturbed by statistics showing that baseball has the oldest, whitest, most male audience of any major sport. I wrote this book because I wanted to explore the reasons why this oldest American-made game is having trouble attracting a younger generation of fans. Consumers of digital media are used to instant gratification, and baseball's attraction is only apparent to those willing to invest enough time to understand what is happening when nothing obvious - like a home run - is taking place. Baseball matters precisely because it stands out as an alternative to our digitally obsessed culture of distraction. In this book, I celebrate the joys of the long game in an impatient world. How is this book in keeping with your other writing? I started my writing career as a reporter for the Washington Post and am best known today for my books about the history of secularism and freethought (Freethinkers: A History of American Secularism, Metropolitan Books, 2004, and The Age of American Unreason, Pantheon, 2008). But I never stopped being a baseball fan. Most of my books deal, on a number of levels, with the importance of critical and logical thinking - and baseball is, as far as I'm concerned, the thinking person's game.